PullOuts allows to grab any piece of content from a web page and display it as a pullout widget. Whether it’s a block of text, images, shopping cart, login, search or subscription form, a video or any other content – you can make it a pullout. Easy to use code generator will help you to set your widgets in seconds. Flexible settings: multiple triggers to active your pullouts, unlimited colors, hundreds of icons and dozens of animation effects will enhance your website and amaze your visitors. 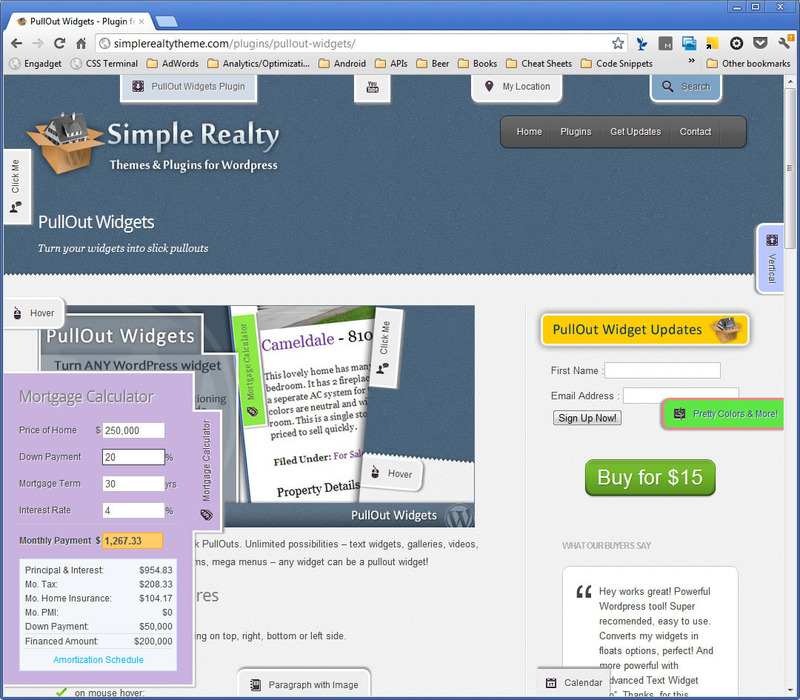 Flexible pullout widget positioning on top, right, bottom or left side. when specified element appears on the screen. 289 slick icons for pullout tabs. Multiple styles for pullout tabs: square, rounded corners, borders, combination of the above. CSS3 vertical and horizontal tabs. PullOuts requires jQuery 1.7+ and jQuery UI 1.8+ libraries, which are included into the package. Fully compatible with all modern browsers including: Internet Explorer 9 and 10, Firefox 3+, Google Chrome, Safari and Opera. Internet Explorer 7 and 8 don’t support CSS3 enhancements like shadows, rounded corners and vertical tabs, but functionality of the script is still intact. Fixed: OFF switch for mobile devices wasn’t working. Removed clearfix class, since it wasn’t used. Improved: removed dependency on jQuery.browser since it’s no longer exist in jQuery 1.9+. Fixed: Icon was not being reflected in the Code Generator after importing widget settings. Fixed: cookie wasn’t being read correctly. Fixed: tab icons didn’t display in IE and Opera. Fixed: widgets stopped working in IE7/8. Some dimension getters were returning NuN, which weren’t correctly validated.